As season three of Star Wars Rebels reached its finale, it was once again plagued by the criticism that it had contained too many “filler” episodes. This usually referred to any episode of a vaguely comedic nature, or more broadly, any which did not focus on its two central story arcs – Thrawn vs. the Rebellion, or Maul vs. Ezra. The argument implies that these episodes, whether it be the adventures of Iron Squadron or AP-5’s musical number in space, are somehow of lesser status, and are written only to fill in a gap in the schedule while we wait for the “real” story to continue. It’s a criticism that has been leveled at the series since the beginning. It is also entirely misplaced. Our expectation that all television series – and particularly science fiction series – should center around a season-long arc which develops from episode to episode is a relatively recent phenomenon. Throughout the sixties, seventies, and eighties, the two tentpole science fiction series in the UK and the US – Doctor Who and Star Trek (both in its original and Next Generation forms) – followed an entirely different format. Classic Doctor Who usually told its stories in four- or six-episode serials, with each constituent episode ending in a cliffhanger. It would then move onto an entirely different serial – new location, new supporting characters and monsters, and often an entirely different tone. Its two experiments with season-long-arcs met with varying degrees of success, and were followed immediately by a return to the traditional format. Star Trek, with its ensemble cast, would tell a different story each week, usually centered on some kind of political or philosophical allegory. This was particularly successful in TNG, where the writers usually devoted an episode to a particular cast member, allowing them to explore and develop all of their main characters. In the case of both Who and Trek, this kind of variety was part of the DNA of the series, and kept them fresh and exciting – you never knew where the TARDIS or the Enterprise would end up next. These expectations began to change in the nineties. 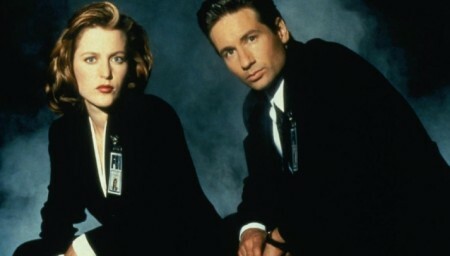 The X-Files, which began as a spooky and entertaining “monster of the week” mystery, quickly began to focus more and more on a “conspiracy” arc, which eventually came to dominate the series to the extent that the early format was almost unrecognizable. This was not always successful and caused some measure of criticism as to its execution, but it did provide a template that soon spread out to other series in the genre. The next iteration of Star Trek, Deep Space Nine, started to tie its seasons together in arcs. Buffy the Vampire Slayer became more arc-heavy with each season, and even from the beginning had a “big bad” villain who was often the driving force behind the conflict. Lost took it a stage further, with its ever-more-complicated mysteries building from one season to the next with no resolution in sight and no true season “finales,” and the 2004 Battlestar Galactica reboot was almost entirely arc-centric. Since Doctor Who itself returned in 2005, it has used season arcs in a variety of ways – some heavy, some lighter. To this day, though, Who is something of a hybrid, a combination of season-long arcs and individual adventures, as are many modern shows, including Rebels. But almost every sci-fi show in recent times has some form of arc underlying it. One notable – and highly relevant – exception was Star Wars: The Clone Wars. The Clone Wars was not a series which told the story of one or two particular characters. Instead it was a backdrop, on which many kinds of stories about many characters could be told. Its stories would alternate between Jedi, Sith, politicians, clones, bounty hunters and droids, without a single core narrative continuing through a season. In typical George Lucas fashion, it would sometimes jump backwards in time to tell a “prequel” without any narration to explain that this was happening – you had to stay on your toes – and its stories would pay homage to a range of filmmakers and genres, from monster movies to Kurosawa to Hitchcockian thrillers, giving it huge variety. When Rebels arrived, it did make use of the season-long arc, and so opened itself to the criticism that any episode which did not advance this arc was “filler.” Modern audiences have come to expect heavily serialized storytelling, because that’s just what television does now, and fans become vocally frustrated when a Walking Dead episode focuses on someone other than Rick or Negan. Each series, though, has its own structure, and must be taken on its own terms. Rebels and The Walking Dead both feature ensemble casts and fully-developed fictional worlds. Any episode which explores a character or reveals something about that world is a worthy story to tell, no less worthy than a story featuring Negan or Thrawn. They are not inherently good or bad stories, and the strength of the television format, as opposed to novels or movies, is that its episodic nature allows for this variety. 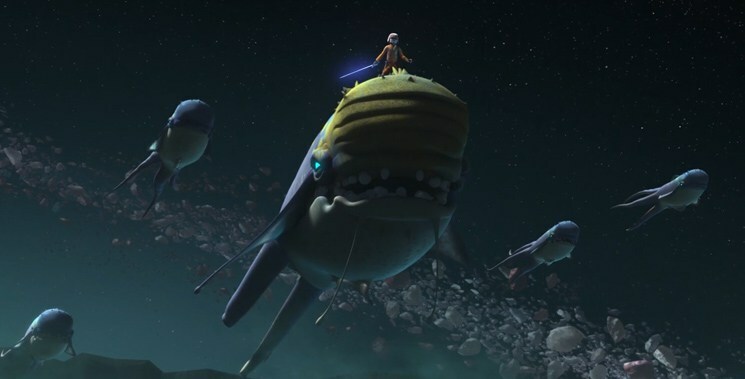 The season two episode “The Call”, in which Ezra manages to connect with the purrgil, is often cited as a “filler” episode, but the story serves many functions. It establishes Ezra’s connection with nature – something later subverted at the end of the season – and in doing so tells us something about the Force, and about Ezra himself. It adds a new layer of depth to the history of the Star Wars galaxy, hinting at the origins of hyperspace travel, and also allows us to explore Hera’s worldview as a pilot. It is also a moving and visually impressive piece of television. AP-5’s adventures in “Double Agent Droid” allow for a little light relief before the heavier material of the Maul and Thrawn finales, but the episode also explores the character himself, his feelings about the Rebellion and the reprogrammable nature of droids, and gives us one of the undeniably greatest moments in the entire history of Star Wars, as he reaches an epiphany while floating through space, and expresses his feelings through song. This ability to take a break from the heavier action for a week and have a bit of fun is a strength of the format. These episodes are telling stories and they are serving specific functions. The criticism that they are “filler” implies not only that they are irrelevant, but also that the creators work less hard on them, that they are just thrown in there because the TV networks need a certain number of episodes. This is rather insulting, and there is no reason to believe that the writers, animators and directors work any less hard on these episodes than they do on any others. Indeed, these episodes keep the series vibrant, and allow for a variety of tone and the exploration of the galaxy and characters beyond the “main” storyline. There is, after all, nothing worse than an arc that you find dull, and standalone adventures at least prevent this from utterly ruining your experience of an entire season. Every series and its structure has to be taken on its own terms, and as an ensemble piece in the huge sandbox of the Star Wars galaxy, any Rebels story that entertains us and tells us a little more about this place and its people is a story worth telling. I’ve just got myself up to date with another series, Steven Universe, and although I find extremely interesting all the story about the Gems in Homeworld and to know what will happen to Earth, every single story has a purpose, smaller as it can be, to give you more insight to the characters, or to the world or the relationships between them. Often, it’s those episodes who are the funnier, since they break away from the main story line. 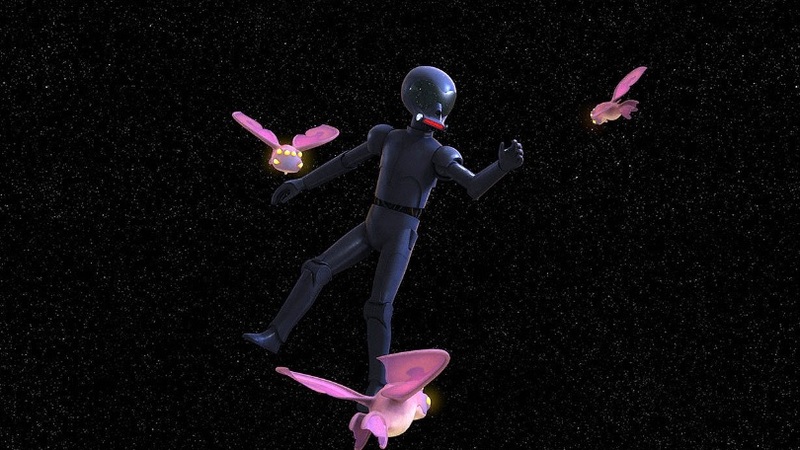 What really irks me is when they do something in an episode that has little relevance afterwards, such as the discovery of the B-wing of which we haven’t seen anything new in the past season, not of the ship, not of the builder… Aside from that, I love everything Rebels gives us and I’m terribly worried that the last season will have so few episodes. I liked the B-wing episode because any chance to have Hera at the front-and-centre of a story is a good thing in my book! It wasn’t a plot that was picked up on later, but it told us something about her character, so I think it was a story worth telling. I agree with you 100% that there are no Star Wars Rebels filler episodes. Each episode has clues in it that are part of the entire story and you have to watch each one to find them along with showing a side of a character that we did not know about. Agree totally with this article. We as fans need to understand it is not possible to make every single episode as heavy in content in relation to the main storyline. The details are what make a lot of sense in terms of the finished product and we might want to see the importance of these lighter episodes as a whole, not just by each of them. Everything hinges on the way these are executed. In SWR’s case I find that the need to fit a whole adventure in a single episode leads to amplifying the series’ problems concerning the characters’ morals or their fanservice superpowers — so to speak — by playing them loose and above all fast. In “The Call” we have our heroes basically having the factory workers die either burnt or eaten alive. In “Double Agent Droid” Hera ‘magically’ remote control-destroys a shipload of people just to showcase her badassery. I loved certain elements of those episodes — nothing beats AP-5’s little moment of contentedness — but in general I find them too problematic. Continuity-heavy episodes usually allow for a little more nuance.